Diane Kochilas has a schedule that is preposterous: restaurant consultant, chef at times, always an author, running her Glorious Greek cooking school on her native island of Ikaria, and now releasing Season 2 of My Greek Table on PBS. You do want to watch Season 2 and catch up on Season 1. 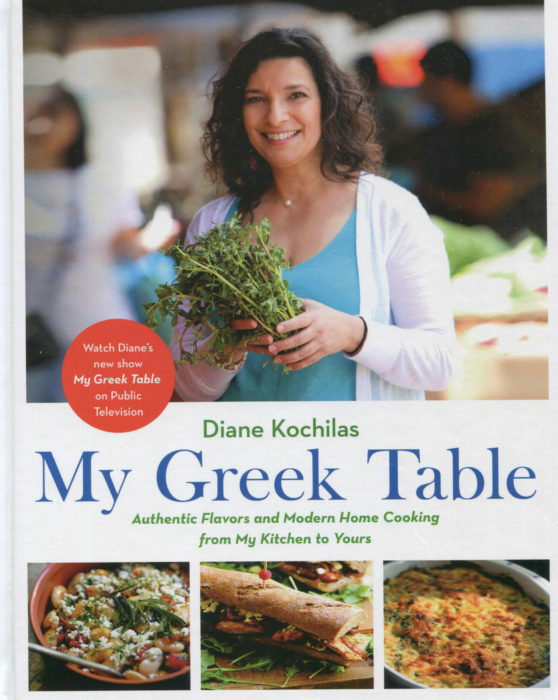 To celebrate Season 2, Diane has just released her latest book My Greek Table. Diane’s books are famous for their authenticity and ease of use. This is “home and comfort” cooking at its best. Diane’s focus here is the family table. That place where dishes are scattered over the tabletop, people reach, people grab, people talk, perhaps they debate a bit, and always they laugh. That laden table is the core of Greek life. It’s a wonderful experience. Especially if the food on the table is glorious Greek. What do we find in My Greek Table? Classics. And surprises. In the first chapter on dips, you will encounter Greek Honey Hot Sauce. There is Greek olive oil and honey, but now jalapenos and hot sauce. Diane welcomes the “globalization” that can enrich all cuisines. A few pages on, this trend continues with her My Secret Classic Cinnamon-Tomato Sauce, with mushroom powder, cocoa powder, cinnamon, allspice, and nutmeg. Fun, bright, and intense with flavor. There are fifteen chapters in this book, more than you normally encounter. That is because there are some very Greek chapters, including Great Beans and Life of Pie. Great Beans offers Giant Beans Baked with Roasted Garlic and Tomatoes and Northern Greek Giant Beans Baked with Red Peppers and Feta. There’s a lovely side note, one of many, telling you all you need to know to cook and relish Greek giant beans. Ah, the Life of Pie chapter begins with the recipe you might expect: Homemade Whole Wheat Phyllo. Then the phyllo is put to use in Spinach-Cheese Pie, Greek Island Onion Pie, Zucchini Pie with Greek Yogurt and Fresh Mint, and other recipes you’ll enjoy year round. Planning a spring picnic when the snow is gone? Here’s your menu. Or, make some now, sit by the fire, and watch the snow first fall and then, eventually, melt. Greek cuisine is close to the earth, heavy in vegetables and grains. Proteins are eaten less, but, when on the table, they are served with elegance. Having a roast chicken? How about Roast Chicken Stuffed with Figs and Olives or Apricot Roasted Chicken Marinated in Greek Yogurt with Raisins. I think the veggie recipes are the brightest beacon in My Greek Table because of their striking diversity. 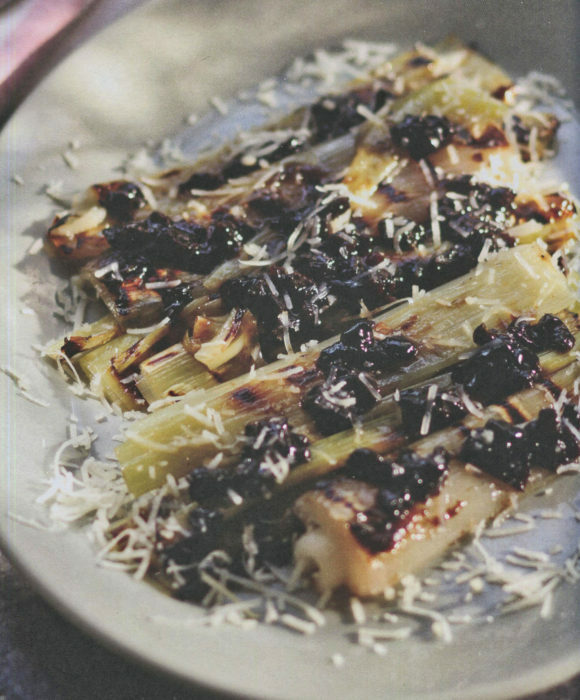 Here’s a picture of the Grilled or Seared Leeks with Shaved Sheep’s Milk Cheese with Prunes. It is an example of an intriguing recipe, one that I find hard to imagine how it will taste. I have no choice: I have to make it. Desserts are here. How could they not be? Ideas that will seem familiar like Greek Yogurt Cheesecake and Dark Chocolate Ouzo Orange Mousse. And then you find Greek Coffee Bread Pudding and Tahini-Honey Phyllo Flutes. Diane is one of those key authors who write with total authenticity. Take a recipe, any recipe, in this book. It is going to work. It is going to please. And, surely, it is going to make you a fan of Diane Kochilas. Think of her as the Greek Julia Child. Yes, she is that good. And so is My Greek Table.